Samford University’s Department of Communication Sciences and Disorders was honored at the Speech and Hearing Association of Alabama’s recent annual convention in Birmingham. Students received the Student Membership Award, unseating another university that had won the award for more than 10 consecutive years. Samford has 22 students who not only became members of SHAA, but also volunteered at least four hours of personal time to the convention. Caroline Todd, a student in the Master of Science in Speech Language Pathology program, was also honored with the organization’s Student Recognition Award. Todd was selected based on her commitment to academics, her leadership skills and overall professionalism. “It is exciting to see that although the Department of Communication Sciences and Disorders is relatively new at Samford, it is quickly establishing a reputation for its commitment to preparing practitioners who are focused on service to others and their profession,” said health professions dean Alan Jung. 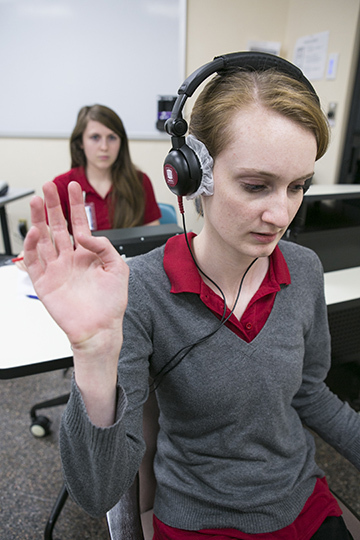 Samford established an undergraduate program in communication sciences and disorders in fall 2014, and students began in the Master of Science in Speech Language Pathology program in summer 2015. The second cohort of Master of Science in Speech Language Pathology students is set to begin in May 2016.